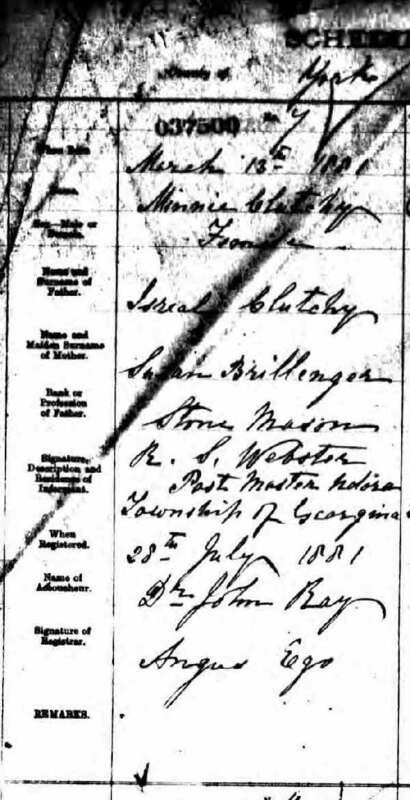 Marriage* He married Lucy Doupe, daughter of Jacob Doupe and Anne Shier, on 27 September 1871 in Camden Twp., Lennox and Addington County, Ontario, Canada. 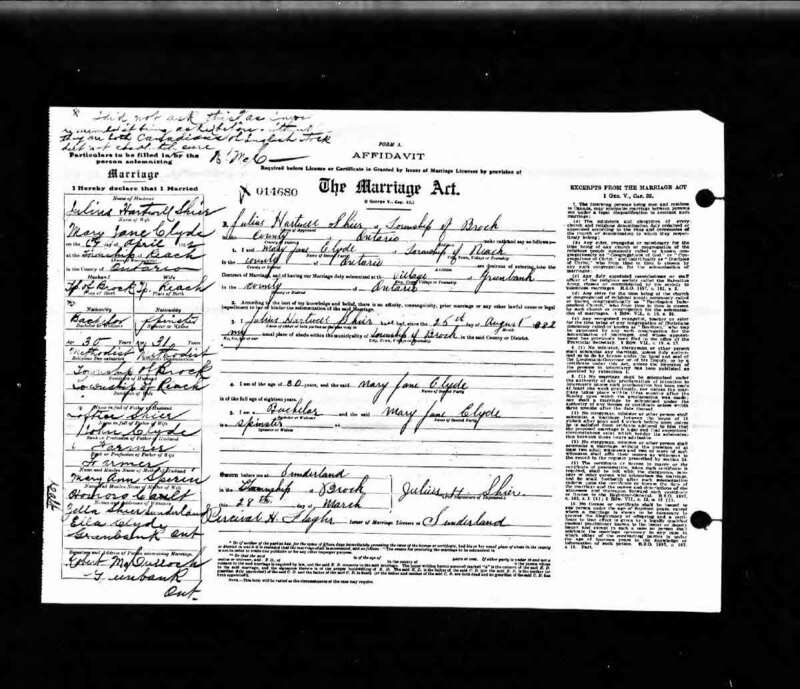 Marriage* He married Matilda (Tillie) Pangborn, daughter of John Pangborn and Barbara P. Shier, on 1 June 1876 in Ellington, Tuscola County, Michigan, United States. 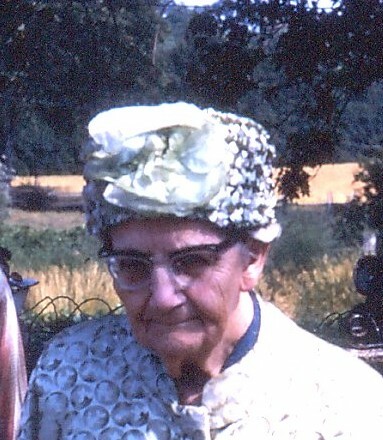 Birth* Minnie Cluchey was born on 13 March 1881 in Scott Twp., Udora, Ontario County, Ontario, Canada. 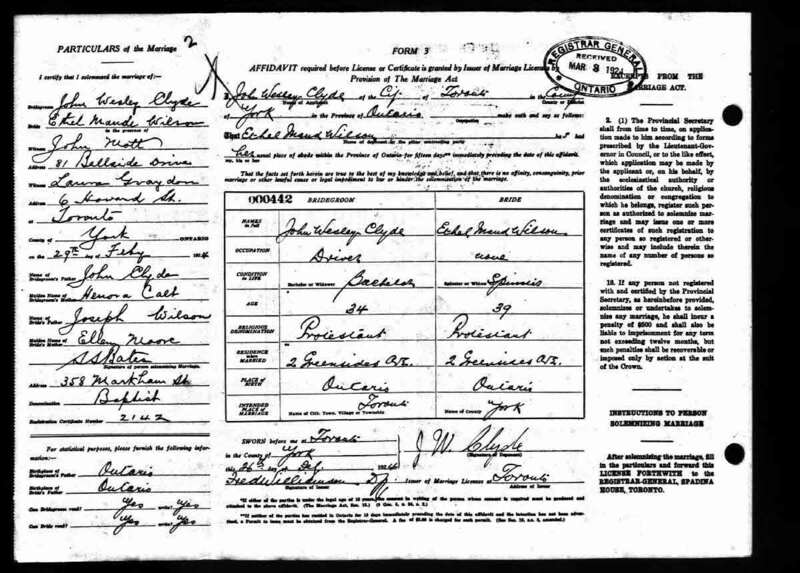 Marriage* Minnie Cluchey married Edwin ERNEST Shier, son of Wyndham Shier and Eliza Jane Long, on 25 July 1899 in Sunderland, Ontario County, Ontario, Canada. 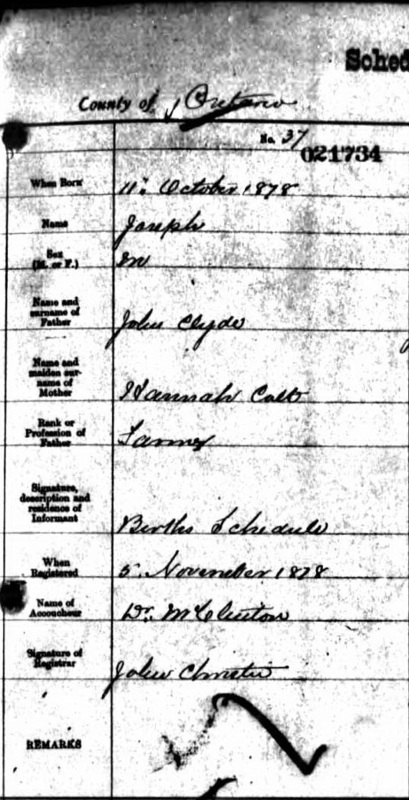 Marriage* Jane Elizabeth Cluson married Richard Shier Sr., son of John (ll) Shier and Catherine Piper, on 10 October 1884 in Lindsay, Victoria County, Ontario, Canada. 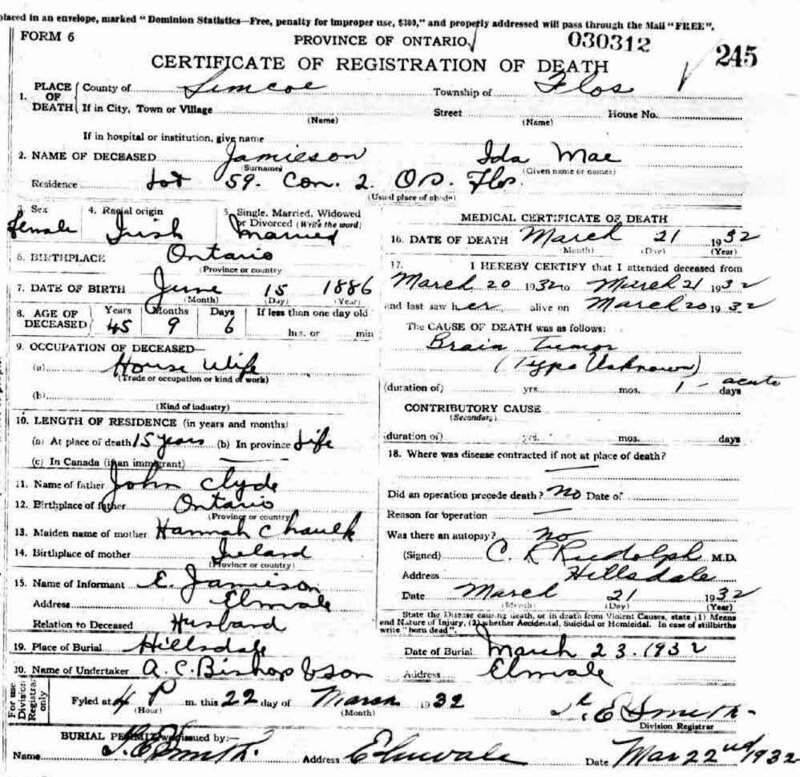 Death* Jane Elizabeth Cluson died on 13 September 1919 in Toronto, York County, Ontario, Canada. 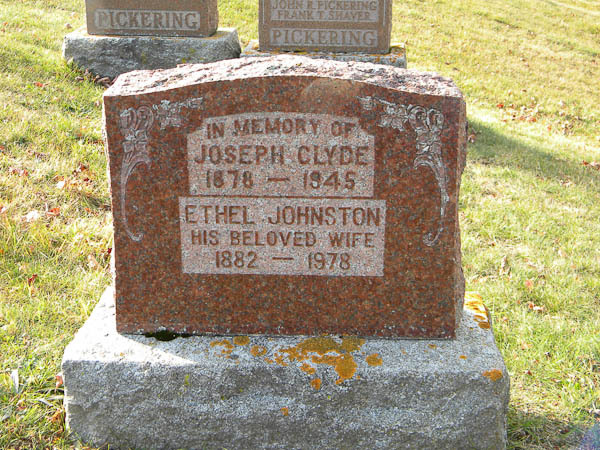 Birth* Ella Alberta Clyde was born on 24 August 1886 in Reach Twp., Ontario County, Ontario, Canada. (Witness) Fact 1 Ella Alberta Clyde witnessed the Fact 1 of John Clyde; Photo of the John Clyde and Honora Calt family in the late 1890's. 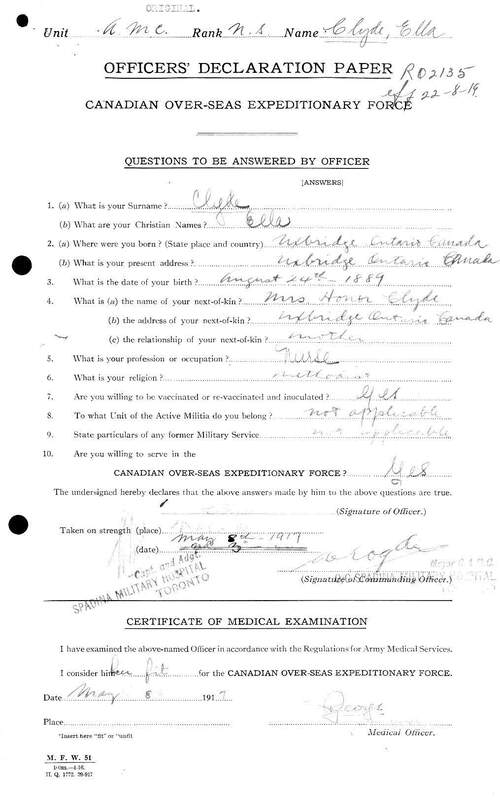 Milit-Beg* Ella Alberta Clyde began military service on 8 May 1917 Enlisted in the Canadian Overseas Expeditionary Force as a Nurse. 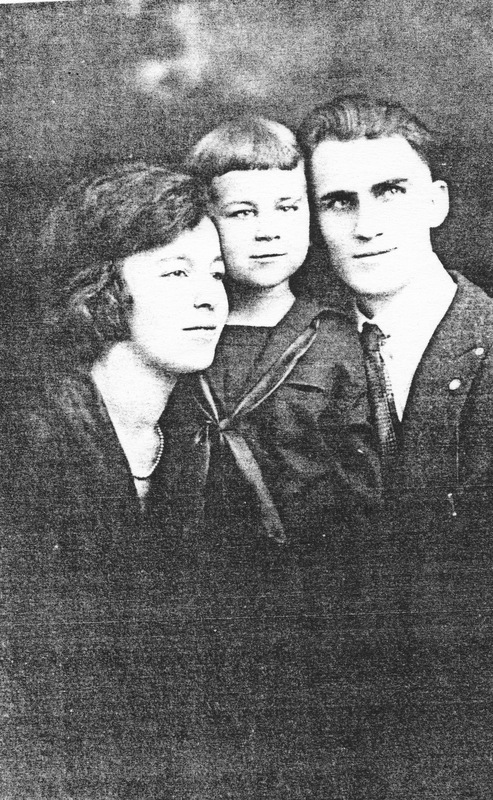 Marriage* She married Rae Martin Fergusson, son of David Ferguson and Ruth Ethleen Thompson, on 15 February 1928 in Greenbank, Ontario County, Ontario, Canada. 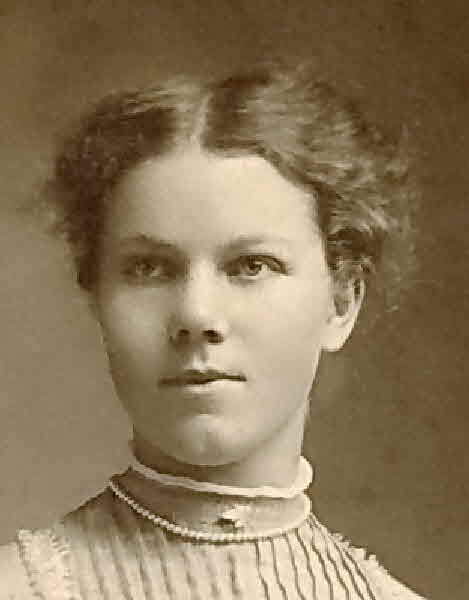 Birth* Ida May Clyde was born on 23 June 1884 in Reach Twp, Greenbank, Ontario County, Ontario, Canada. (Witness) Fact 1 Ida May Clyde witnessed the Fact 1 of John Clyde; Photo of the John Clyde and Honora Calt family in the late 1890's. 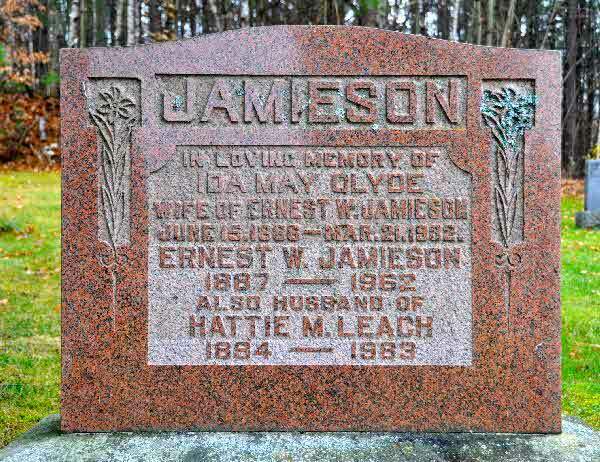 Marriage* She married Ernest William Jamieson, son of David Johnston Jamieson and Elizabeth German, on 29 September 1917 in Toronto, York County, Ontario, Canada. 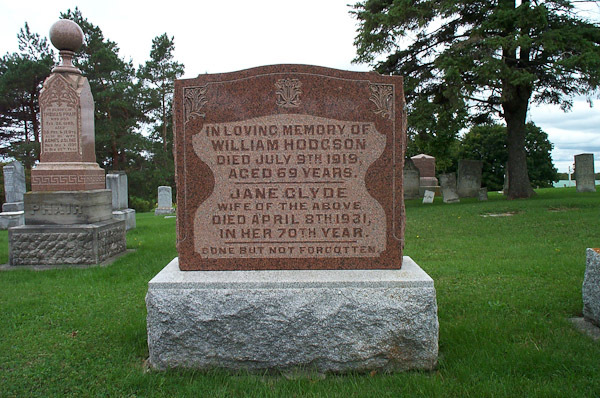 Death* Ida May Clyde died on 21 March 1932 in Lot 59 Conc 2 Flos Twp., Elmvale, Simcoe County, Ontario, Canada, at age 47. Burial* She was buried on 23 March 1932 in Hillsdale United Church Cemetery, Flos Twp, Hillsdale, Simcoe County, Ontario, Canada. 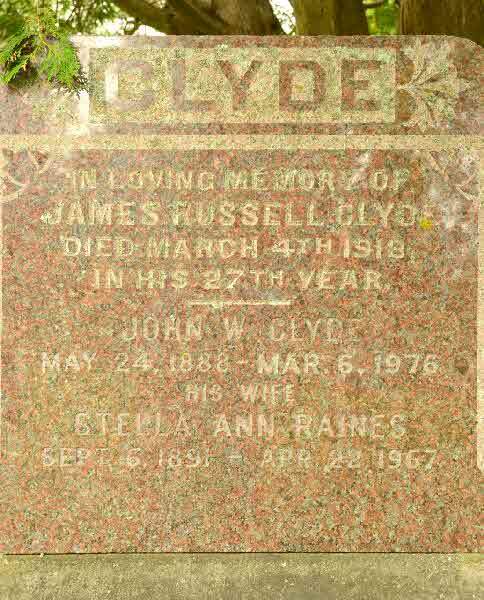 (Witness) Fact 1 James RUSSELL Clyde witnessed the Fact 1 of John Clyde; Photo of the John Clyde and Honora Calt family in the late 1890's. 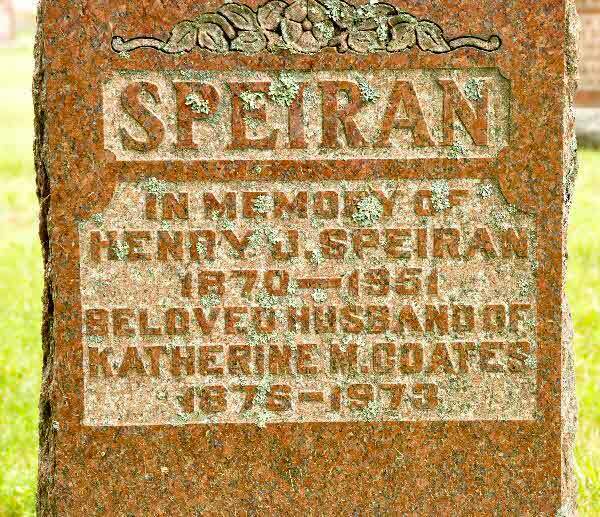 Burial* He was buried in Prince Albert Cemetery, Reach Twp., Port Perry, Ontario County, Ontario, Canada. 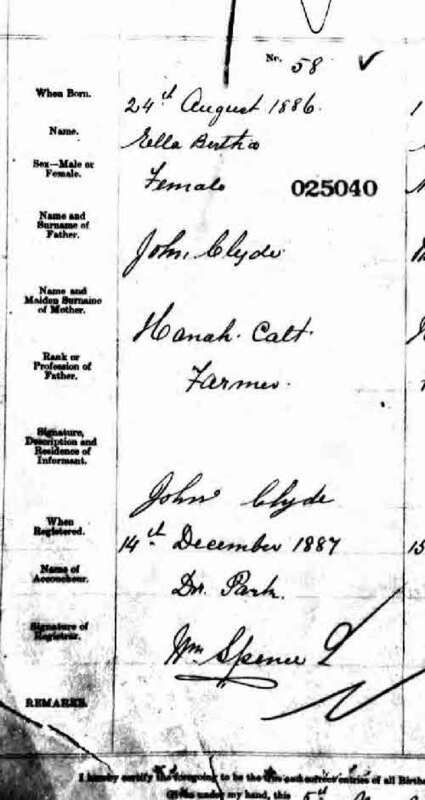 Marriage John Clyde married Honora Calt, daughter of Patrick Calt and Mary Colleran, on 14 February 1877 in Reach Twp., Ontario County, Ontario, Canada. Fact 1* Photo of the John Clyde and Honora Calt family in the late 1890's. Death* He died on 9 April 1937 in Reach Twp., Ontario County, Ontario, Canada, at age 82. 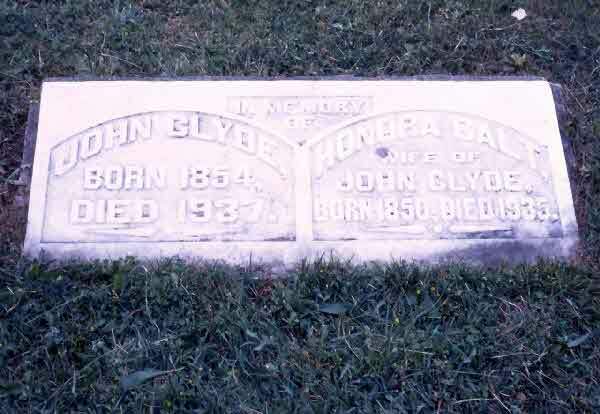 Birth* John Wesley Clyde was born on 24 May 1889 in Reach Twp, Greenbank, Ontario County, Ontario, Canada. 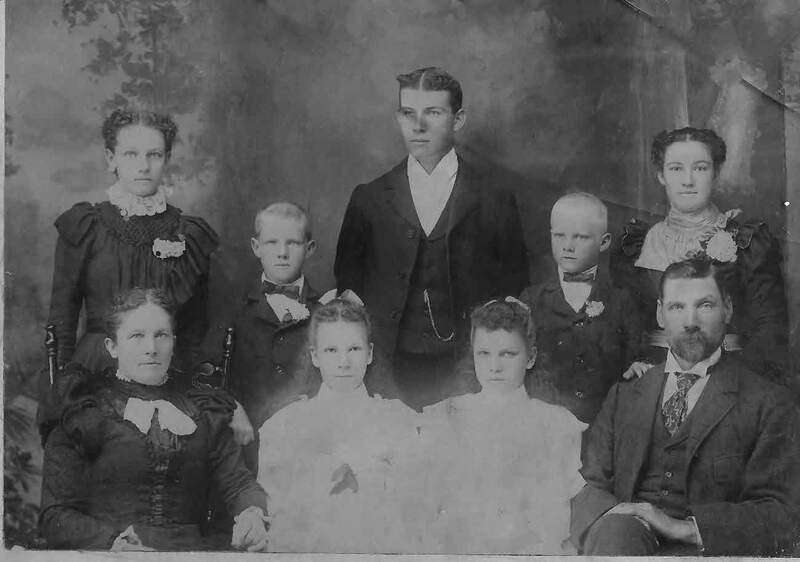 (Witness) Fact 1 John Wesley Clyde witnessed the Fact 1 of John Clyde; Photo of the John Clyde and Honora Calt family in the late 1890's. 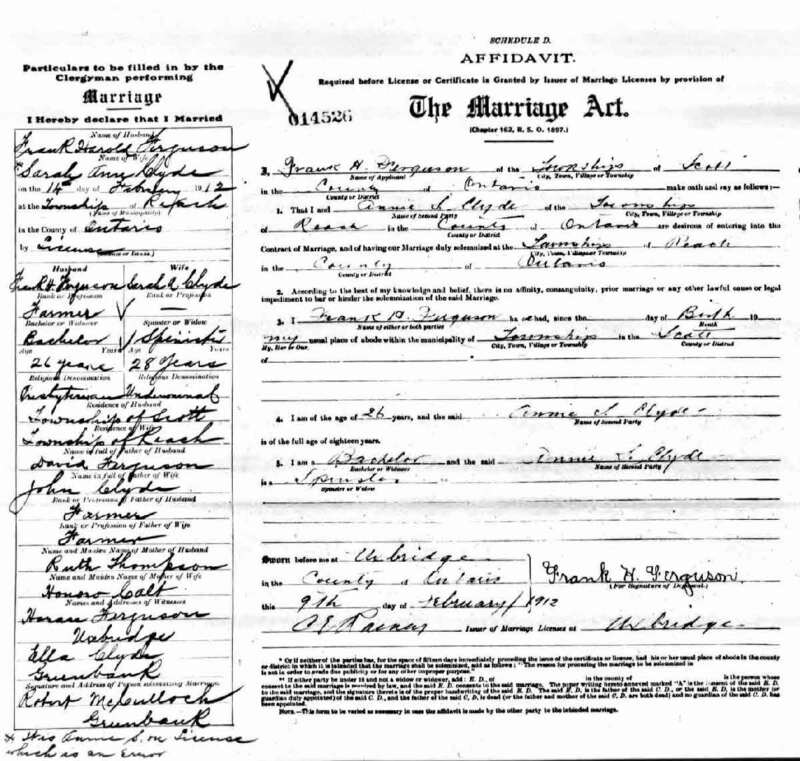 Marriage* He married Ethel Maud Wilson, daughter of Joseph Wilson and Ellen Moore, on 29 February 1924 in Toronto, York County, Ontario, Canada. 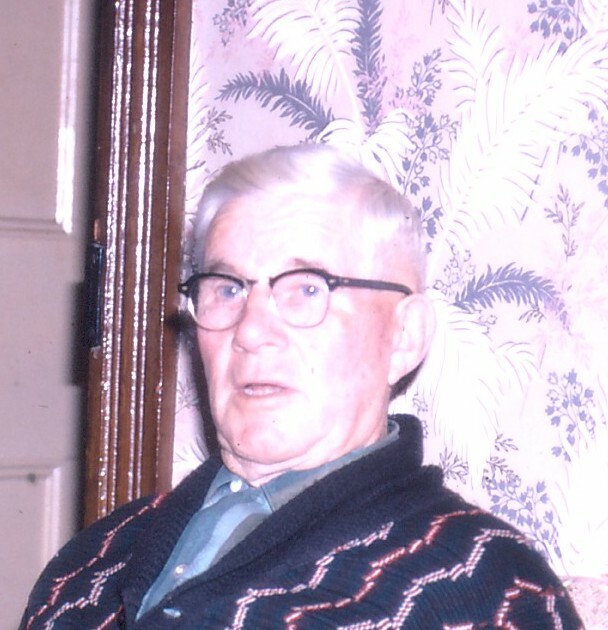 (Witness) Marriage John Wesley Clyde witnessed the marriage of Jean Burton and Gordon Thomas Dearlove. 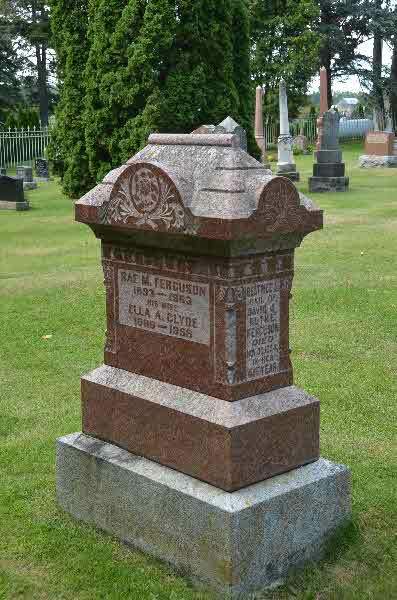 Burial* He was buried in Prince Albert Cemetery, Reach Twp., Ontario County, Ontario, Canada. 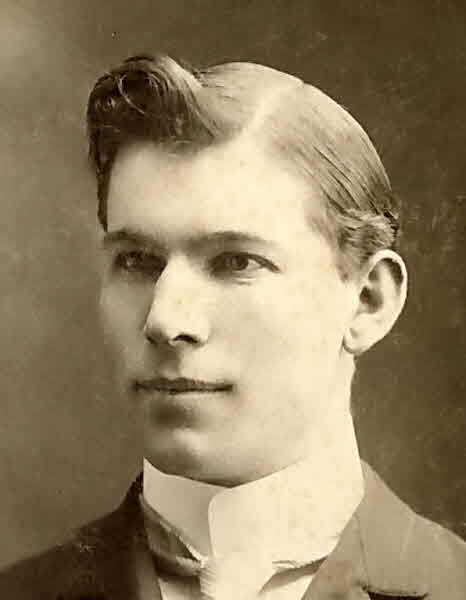 Birth* Joseph Clyde was born on 11 October 1878 in Greenbank, Ontario County, Ontario, Canada. (Witness) Fact 1 Joseph Clyde witnessed the Fact 1 of John Clyde; Photo of the John Clyde and Honora Calt family in the late 1890's. 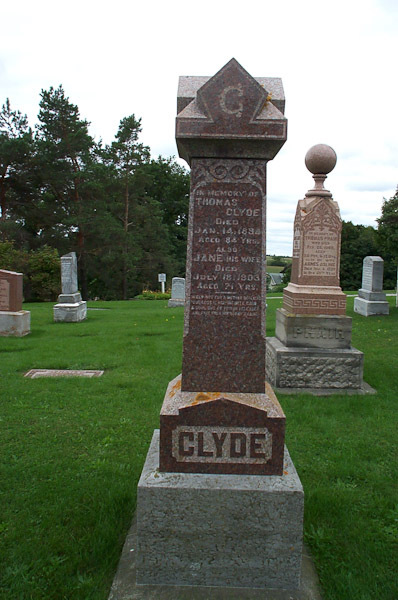 Death* Joseph Clyde died on 1 October 1945 in Uxbridge, Ontario County, Ontario, Canada, at age 66; The family and many friends of Joseph Clyde were shocked at the news of his sudden death at his home here on Monday night last. Mr. Clyde had been in his usual health right up to the time he retired for the night but between midnight and 1 a.m. he took a sudden heart seizure from which he passed away. While he had not been in the best of health for some time past, he was much better than usual and was completing arrangements for the handling of his famous "Imperial Boiler Compound" in Toronto which he hoped would be an occupation that would not tax his strength so much as the heavy work as a machinist had done. He was in his 67th year. The funeral will take place today, Thursday, October 4, 1945 to Uxbridge Cemetery, services being conducted at his late residence by Rev. 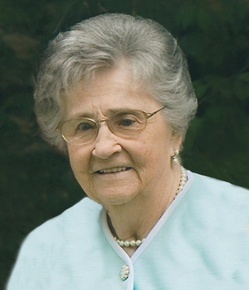 L. E. Atkinson, of Trinity United Church. 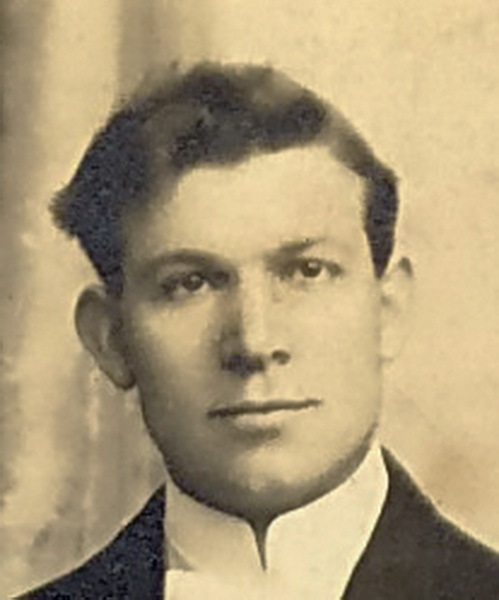 The late Joseph Clyde was born in Greenbank, Ontario, in 1878 and received his early education there. 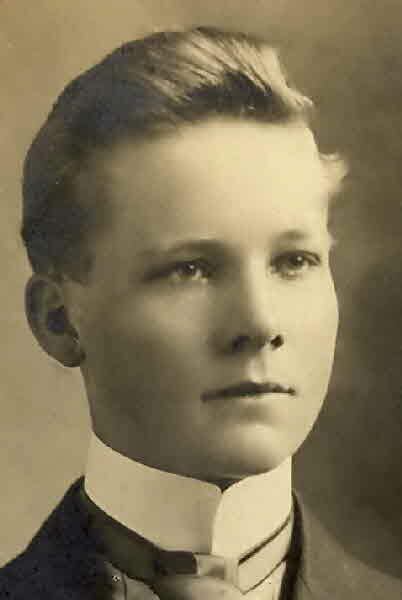 He graduated from the School of Practical Science, Toronto, in engineering and went to work as first engineer on the boats on the Great Lakes for some years and then to the Canada Foundry Co., Toronto, where he spent a few years. 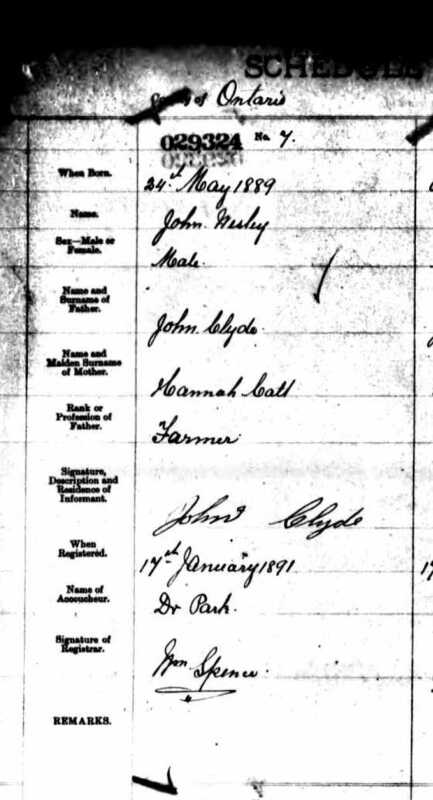 In 1906 his married Miss Ethel Johnston and in 1909 they came to Uxbridge and bought the Haggart Foundry which he continued to operate until a few weeks ago when he sold it to his son, Ross. He was a mechanical genius and his ability and work took him to all parts of the province. He was keenly interested in machinery of all kinds and especially boilers and was for years government inspector of boilers, and in machinery it had to be something extrordinary that stumped him, in fact from our personal acquaintance with him for the past twenty-seven years we never knew a mechanical problem of any kind that he could not solve and remedy. 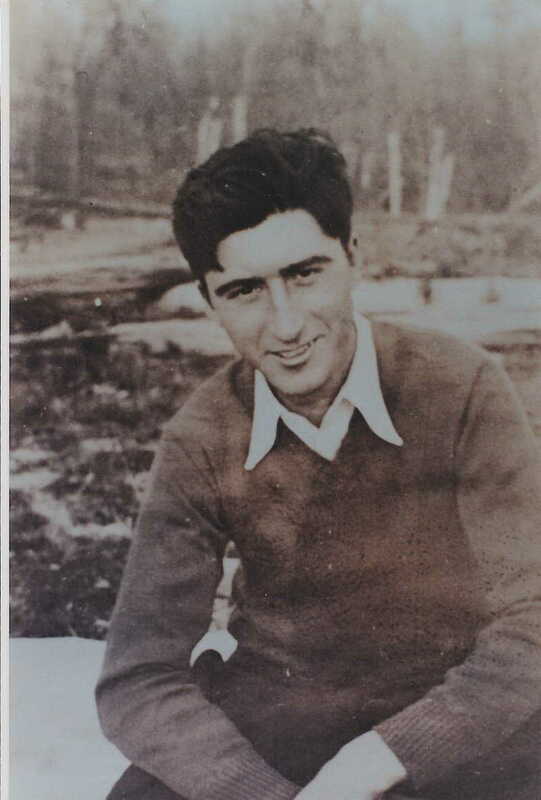 "Joe" as he was familiarly known throughout the country, took great interest in Uxbridge and it was through his efforts that we finally managed to get our present excellent domestic water and fire protection. He was also of an inventive type of mind and built several machines for various operations for people throughout the district and also perfected a particularily good boiler compound for the prevention of scale and cleansing of boilers which he had a great sale amongst threshers and other users of steam and hot water boilers. He was working up a splendid connection in Toronto with it when the sudden call came. Left to mourn his death are his sorrowing wife, one son Ross, of Uxbridge and one daughter, Jean, now in training as a nurse in the Women's College Hospital, Toronto, also a brother Wesley of Toronto, and three sisters, Mrs. Julius Shier, Sunderland, and Mrs. Rae Ferguson of Uxbridge and Mrs. Frank Ferguson, Adanac, Saskatchewan to whom the sympathy of a wide circle of friends and acquaintance is extended in their sudden sad loss. 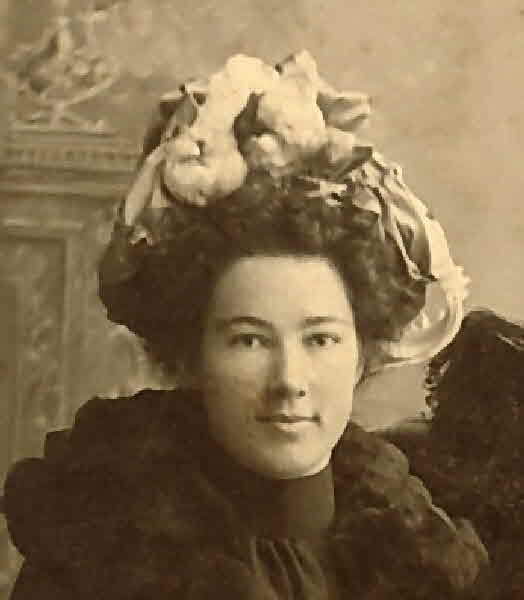 Birth* Mary Jane Clyde was born on 13 March 1880 in Reach Twp., Greenbank, Ontario County, Ontario, Canada. (Witness) Fact 1 Mary Jane Clyde witnessed the Fact 1 of John Clyde; Photo of the John Clyde and Honora Calt family in the late 1890's. 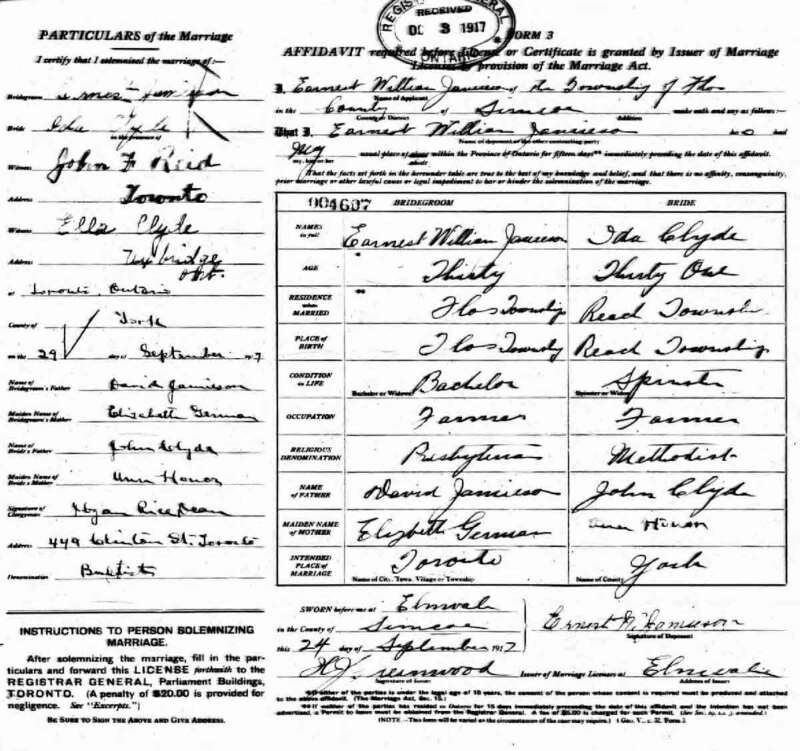 Marriage* Mary Jane Clyde married Julius Hartwell Shier, son of Richard LOFTICE Shier and Mary Ann Speiran, on 12 April 1911 in Reach Twp., Greenbank, Ontario County, Ontario, Canada. 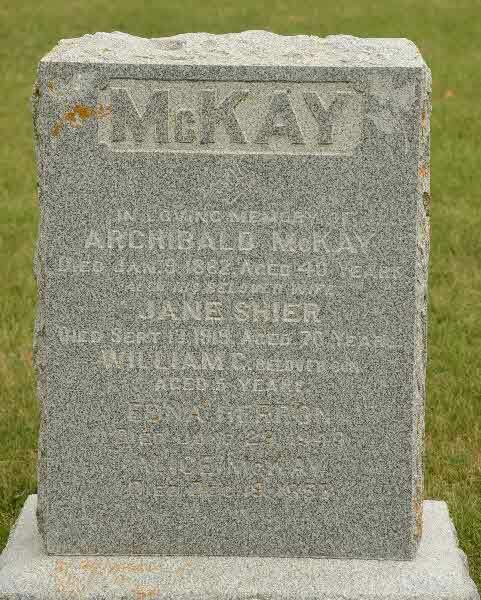 Burial* She was buried on 2 December 1967 in Sunderland Cemetery, Brock Twp, Ontario County, Ontario, Canada. 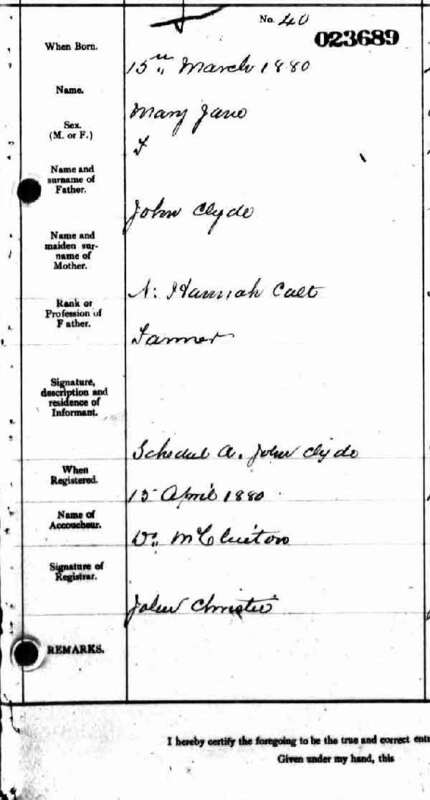 (Witness) Fact 1 Sarah Anne Clyde witnessed the Fact 1 of John Clyde; Photo of the John Clyde and Honora Calt family in the late 1890's. 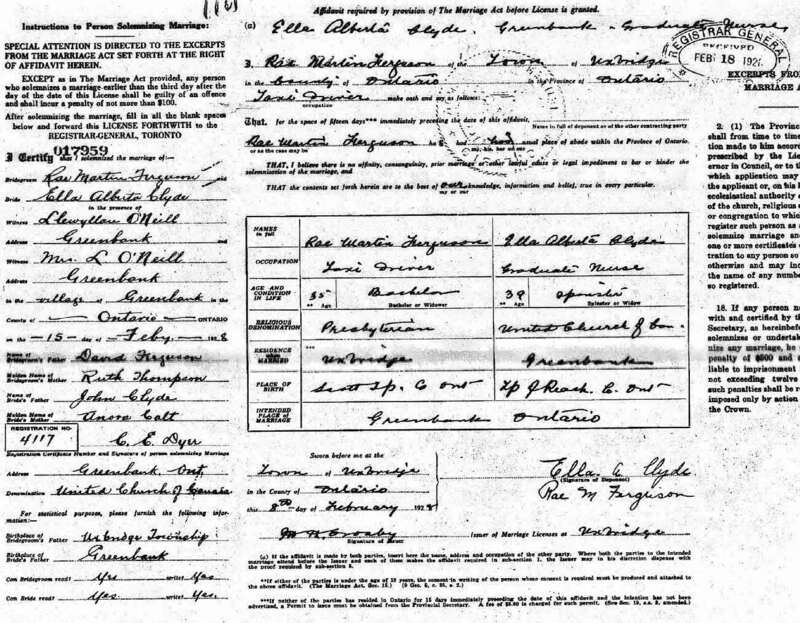 Marriage* Sarah Anne Clyde married Franklin Harold Ferguson, son of David Ferguson and Ruth Ethleen Thompson, on 14 February 1912 in Reach Twp., Ontario County, Ontario, Canada. 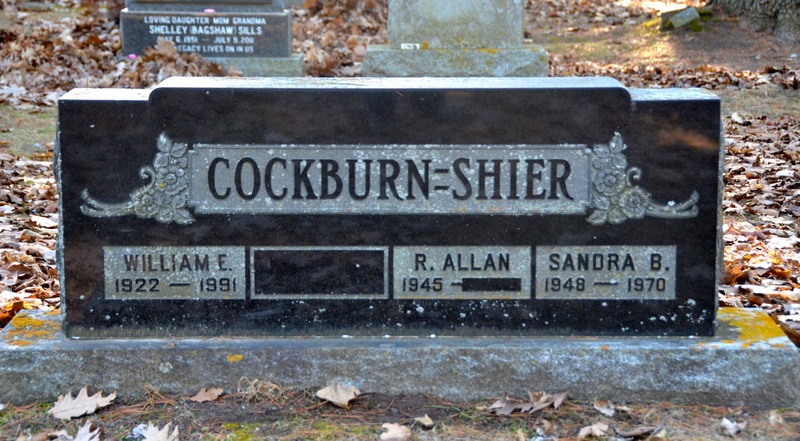 Burial* He was buried in Greenbank Cemetery, Reach Twp., Greenbank, Ontario County, Ontario, Canada. Burial* She was buried in Udney United Church Cemetery, Rama Twp., Udney, Ontario County, Ontario, Canada. [S39] Unknown compiler, online unknown url, unknown author (unknown location). 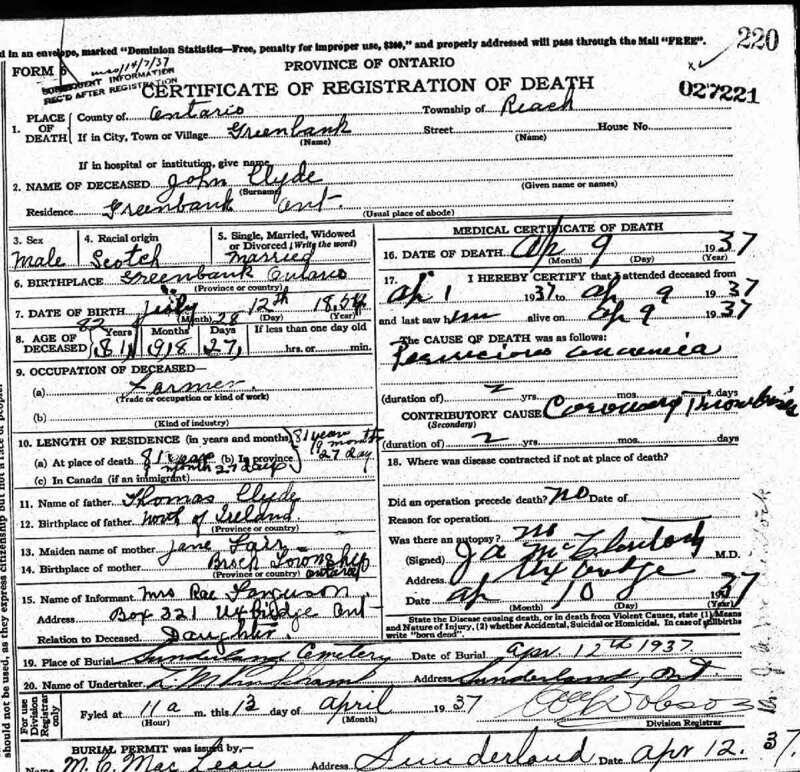 Death* Edith Cochrane died in 1949. Burial* She was buried in Stone Church Cemetery, Thorah Twp., Beaverton, Ontario County, Ontario, Canada. [S81] Unknown title, online \, Marriage of Bamlet Shier and Elizabeth Coe FHL FIlem Number 101367. 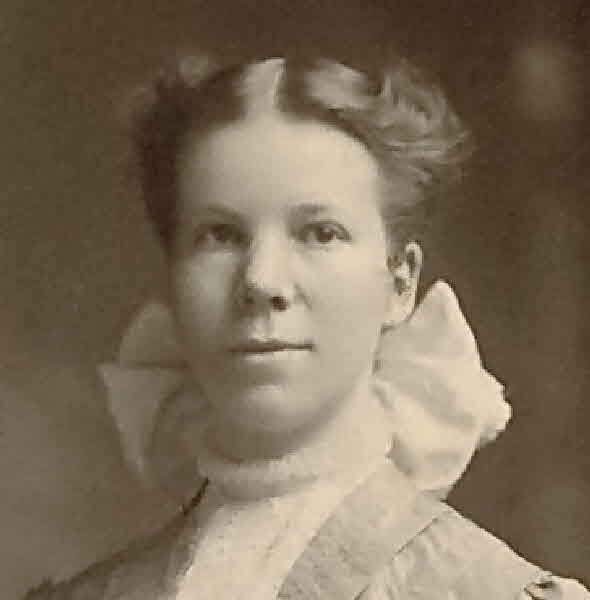 Death* Agnes Isabella Cole died on 22 March 1918 in Toronto General Hospital, Toronto, York County, Ontario, Canada. 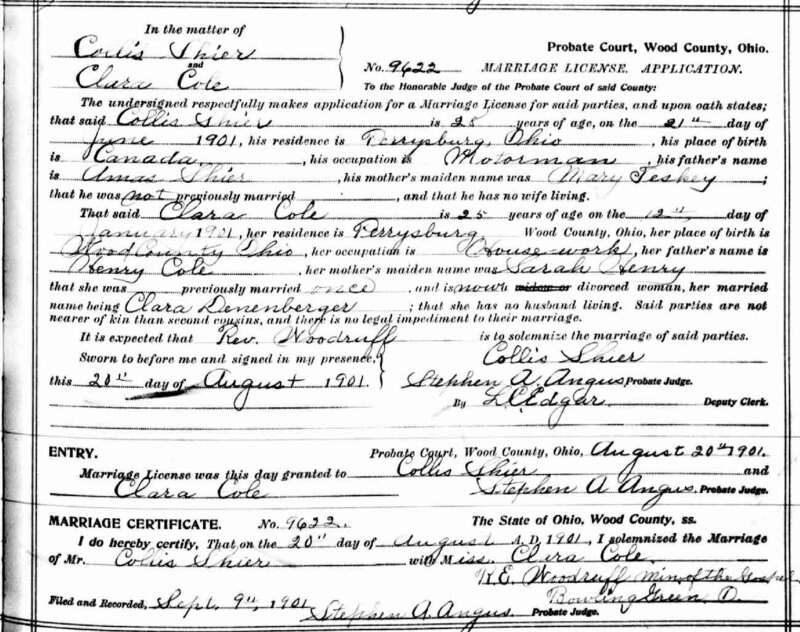 Marriage* Clara E. Cole married Collis Switzer Shier, son of Amos Shier and Mary Susan Teskey, on 20 August 1901 in Bowling Green, Wood County, Ohio, United States. Burial* She was buried in Woodlawn Cemetery, Toledo, Lucas County, Ohio, United States. 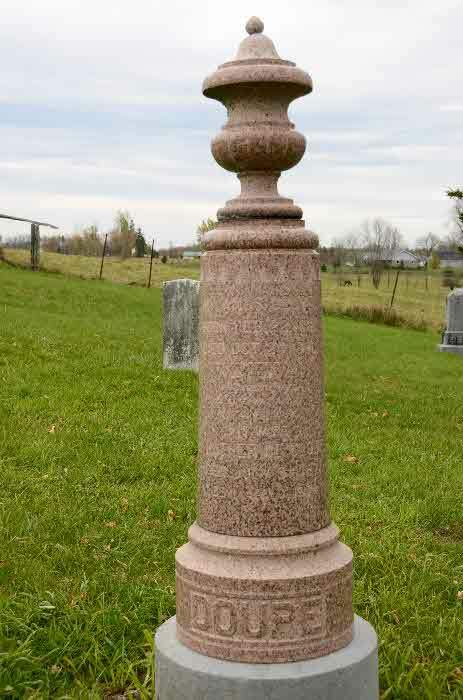 [S40] Saskatchewan Cemetery Project, online \, The Bissett aand Area Historical Society. 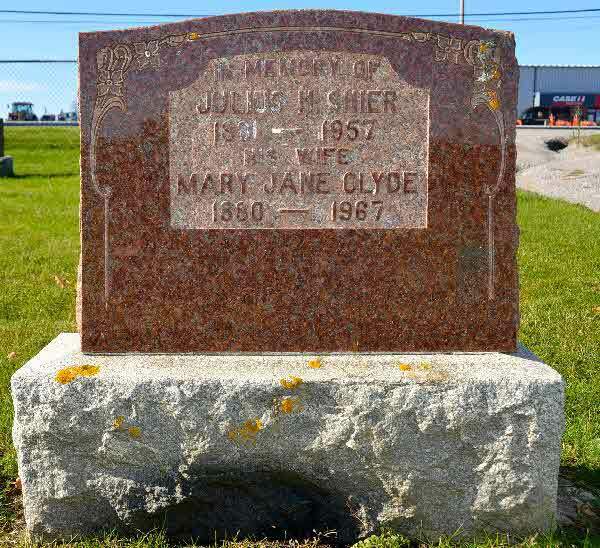 Marriage* Mary Cole married John Edwin Shier, son of John Shier and Susan Doble, on 19 January 1898 in Saugeen Shores, Southampton, Bruce County, Ontario, Canada.